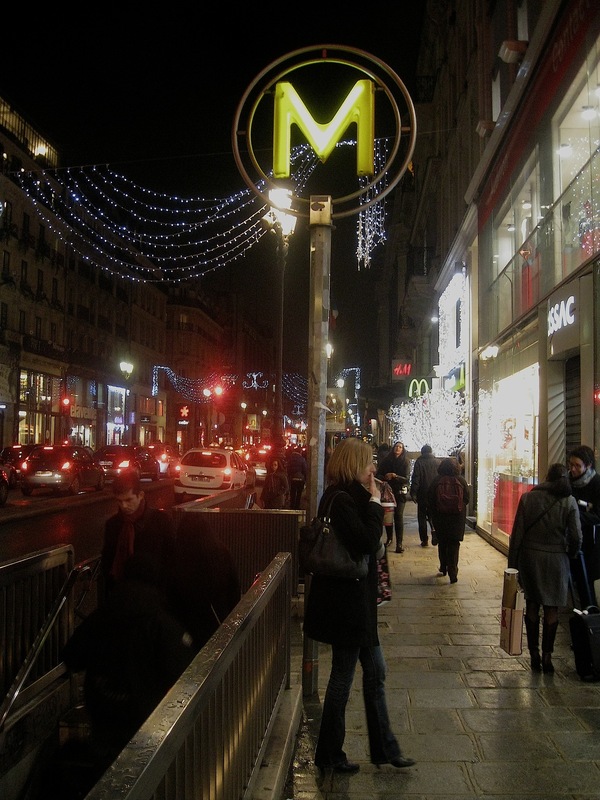 I jumped off the cheap air flight at the Charles De Gaulle Airport and wormed my way onto an RER train which let go of me back at the St. Michel stop in Paris. I hefted my geared, mercifully minus the few kilos that I had shed back in Aberdeen, over to Hotel St. Andre des Arts, where Fred was waiting to say ‘Bon soir’ once again. It was getting on in the evening and I needed resr as I felt the airborne bug in the plane begin to work on me subtly. The next day I awoke and considered my options. Fortunately Paulette Caron had contacted me again the evening before. We were going to watch a performance later that evening. Meanwhile I had to get some cash. I had found the one exchange establishment that I could trust over by the Louvre. I made my way there to exchange my pounds and dollars. It was mostly a restful day. I did a little small gift shopping to make sure that my back still had something to complain about. But mostly I kept a low profile and hoped that it, whatever the next installment of Euro-malady might be, would be held at bay. But little sniffles were coming. 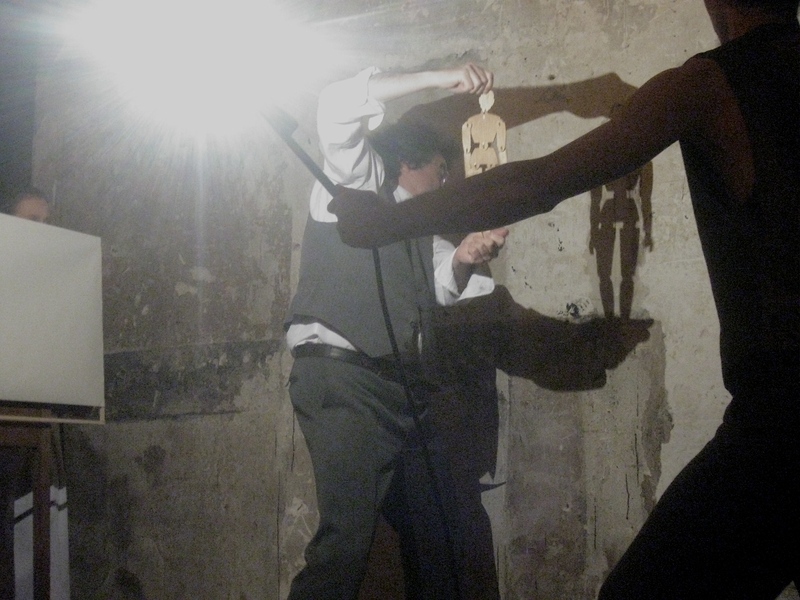 That evening, after passing African butcher shops and Middle Eastern fruit stands, I met Paulette and her boyfriend at the Lavoir Moderne Parisien, a performance space up in the 18e Arrondissement. 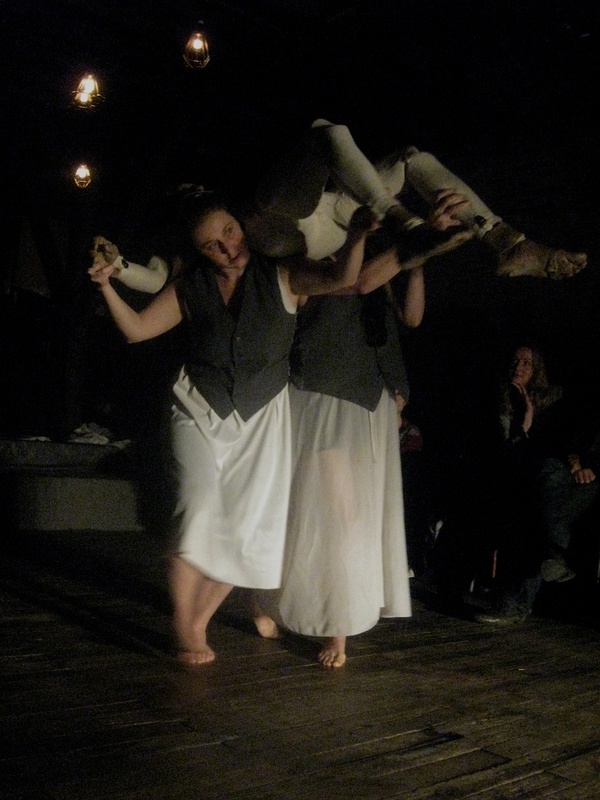 The show for the evening was being performed by a theatrical collective called Scène Infernale and it was based on the works of Bruno Schultz. 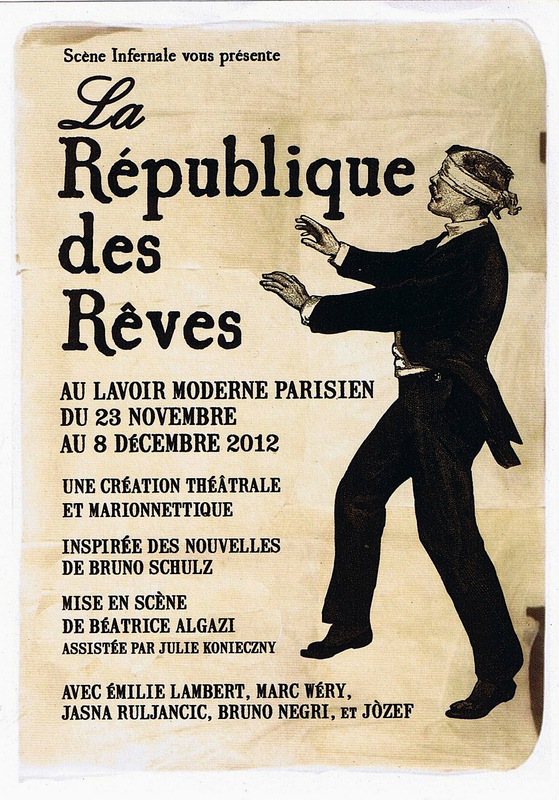 The title of the piece was ‘La République des rêves’ (or The Republic of Dreams). We waited in a foyer that featured various objects and debris related to the theme of the evening: a little automatic race horse game, many pieces of paper, a few chairs and a shabby bed. We Eventually were seated in seats more appropriate for five year olds on two sides of a performing zone in what felt like it once been an old garage. 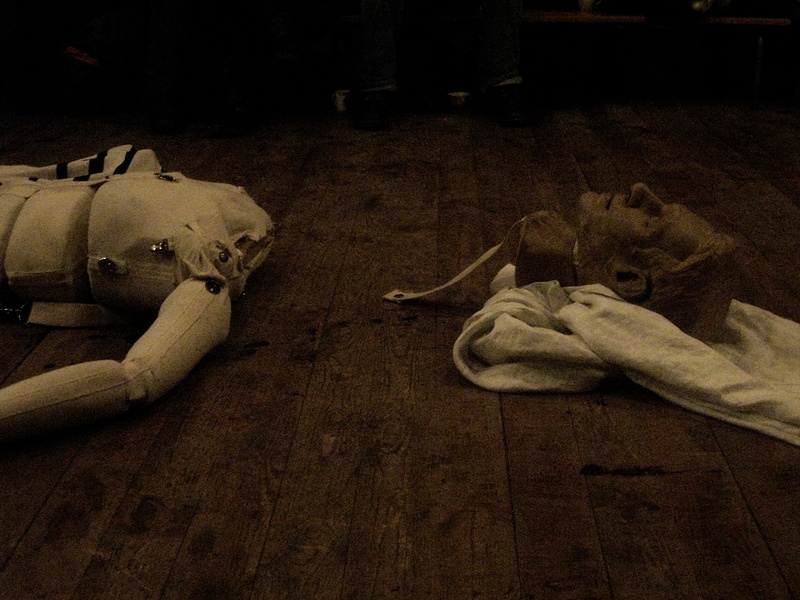 The show began: Several performers were massaging the head and body of the full sized mannequin like puppet. It was clear that they were like a Greek chorus of the Fates opening his sleeping mind to dream. Now from what I could gather he dreams about his bad relationship with his rather compulsive father. And in the end the mannequin, our dreamer, is left decapitated on the ground. Things have not gone smoothly in the search for redemption. Now in fact I’m sure I missed a lot since the play was actually quite word heavy. Paulette filled me a little afterwards. Some of the imagery was quite fascinating. Much of it was done in the Object Theatre style, which tends to be an experimental theatre piece with puppets and other symbolic objects, in this case some of those things included bottles, cut out images of birds placed into the bottles with water, and most intriguingly from my perspective was the use of fully working light bulbs and other illuminating devices as objects themselves. Now I’ve come to see a fairly clear difference between the theatrical use of puppets and the puppet theatre’s use of actors and objects. I felt that François Lazaro’s piece was more of an intellectual puppet show. While the Scène Infernale’s was more on the side of object theatre, the actual play was not as much about the puppet as it was about the father, an actor. Nevertheless it was a fascinating experience and a fitting final piece of puppet related theatre to observe in Europe this time round. I bid farewell to Paulette and company knowing we would be meeting the next morning to discuss the possibility of her coming to Alaska to work on a bit of puppetry while she was visiting her American friends and relatives in March. On Wednesday December 5th, my last full day in Paris, in France, in Europe, after spending a couple of hours in lively discussion with Paulette, I felt again the need to rest. Since the thing that had been trailing me with more ingredients for a head cold was getting closer to a full manifestation. And yet it was my last day, I couldn’t simply stay in the hotel. I decided to go out into the damp early evening, perhaps around four, to buy the final items on my list of gifts from Europe for various folks back home. That at least was my plan. But there was still one more person I hadn’t spoken to in Paris yet. And that was Aurélia Ivan, the gifted student I had met back in 2005 at l’Ecole Nationale Supérieure des Arts de la Marionnette in Charleville-Mézières. I had played a game of tag with her starting in Lyon. Last time I was in Paris she was crazily busy and I missed the opportunity to talk with her. I had heard from her in Scotland, but was pretty much expecting similar results with my two day window of time. But suddenly that afternoon she sent me a message to meet her at the Centre Pompidou. And so I hopped on the Metro and arrived in good time at the center’s massive lobby. And I waited for Aurélia. And I waited. And then I waited some more. She’d said around five. It was getting closer to five-thirty. I wandered around looking for her, in case she had hidden herself in the bookstore or up in the restaurant. Then I noticed a lower level. I thought I saw her looking up at a television screen down there. No such luck. Eventually she sent a text message saying ‘J’arrive.’ And so I knew she was getting close. She finally arrived in a shiny yellow raincoat, which was covering what looked like predominately black clothes, quite the Symbolist color scheme. (She asked me not to take a photo and seemed a bit perplexed that she might be photographed wearing yellow. Plus you never know who might see such a photo on this damned internet.) At first we greeted each other in a friendly manner. There was a little bit of reservation on both of our parts. I knew she was quite (insanely) busy. And she was a bit uncertain as to what my whole project really was. (The operative word here was ‘really’.) Meanwhile she took a cellphone call that seemed to last an eternity. Finally she was making funny gestures as if to say ‘Finish already’. When the interminable finally terminated we were at last free to talk and she made it a point to blow off the rest of the calls trying to find her. Well that question opened the door to another hour of discussion, argumentation, and finally laughter and real friendship. I won’t even begin to summarize the whole discussion. Talking with Aurélia is a bit like… Have you ever seen images of Nadia Comaneci, the famous Romanian gymnast, concentrating on the balance beam in the 1976 Montreal Olympics? It’s an unshakeable focus. Well Aurélia, may live in Paris, and be losing her original language to some degree, but like her fellow Romanian she is unshakeable. At one point we were having an intense philosophical disagreement. And I said ‘Usually, in English, (The key point here!) I can win my arguments.’ She looked at me, simply smiled and said (I can’t do justice to her French phrase.) ‘Well admit it you’ve lost now.’ I laughed. She repeated it as if to say, don’t even try I have a Royal Flush. And we both laughed. Well we strolled through the wet Parisian streets over to the Châtelet Metro stop. We would meet again in 2013 when her Android play was ready and I could interview her for the film. She grabbed a bus to take her home to Clichy and I walked over to the Metro. I stopped for a moment and looked at the French streets, the Christmas lights, the people. It seemed like a perfect moment. 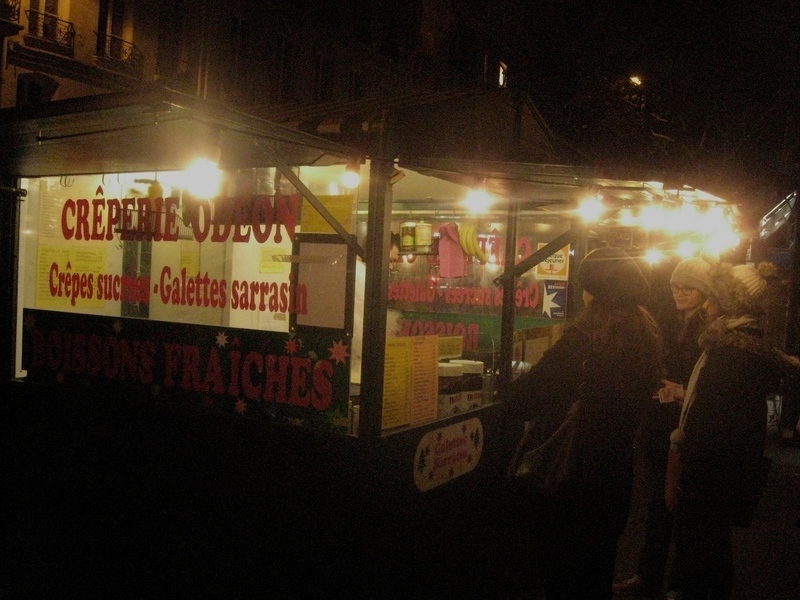 I jumped out at Odeon and happily waited in line at my favorite crêperie. I talked with Fred at the hotel desk again. And spent my final night in Paris reflecting on the people and events of this journey. Waiting in line at my favorite crêperie, for my last Parisian supper. Which I shall unravel next time in the last chapter of this first part of the Gravity From Above Journal.